An extremely attractive three storey Brackenbury Village house with leafy outlook south over gardens to the rear. 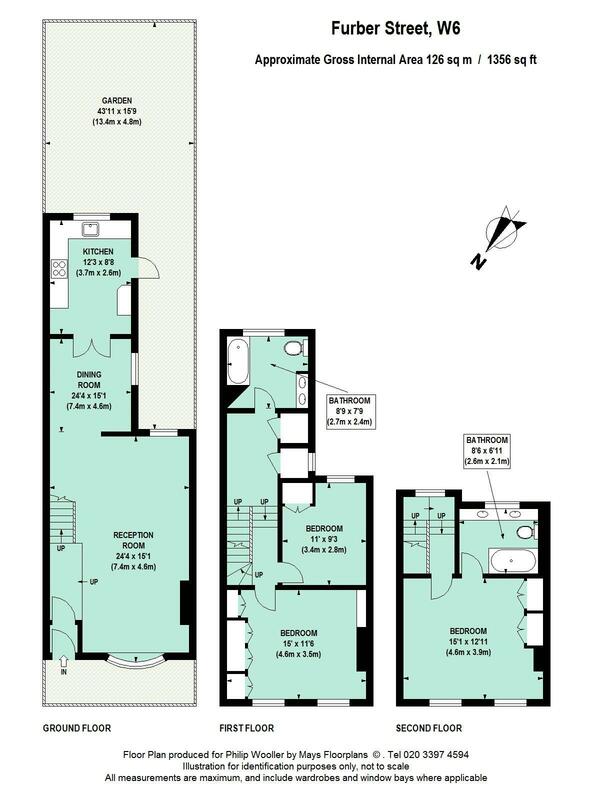 The house offers a spacious open double reception leading into the kitchen/breakfast areas. Upstairs there are three good double bedrooms and a bright and spacious top floor master suite. Furber Street lies at the southern end of Nasmyth street and joins Dalling Road near Paddenswick Road, just east of Ravenscourt Park and within the catchments of excellent local state schools including John Betts and West London Free School. It is close to the shopping and transport hubs of Hammersmith and Westfield, and Ravenscourt Park tube station (District Line) is within a few minutes walk. 1356 sq ft / 126 sq m approx.